Chromalox replacement temperature controller is pcn 314528 4040-arr000, 1/4 din, soft start,universal input, output 1 Analog (0/10V, 0-20mA, 0-5V, 2-10V, 4-20mA), output 2 relay (2amp resistive at 240VAC), output 3 relay (2amp resistive at 240VAC),100-240 VAC Power Supply. 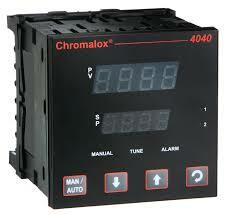 Chromalox replacement temperature controller is pcn 314510 4040-rrr000, 1/4 din, soft start,universal input, output 1 relay (2amp resistive at 240VAC), output 2 relay (2amp resistive at 240VAC), output 3 relay (2amp resistive at 240VAC),100-240 VAC Power Supply. 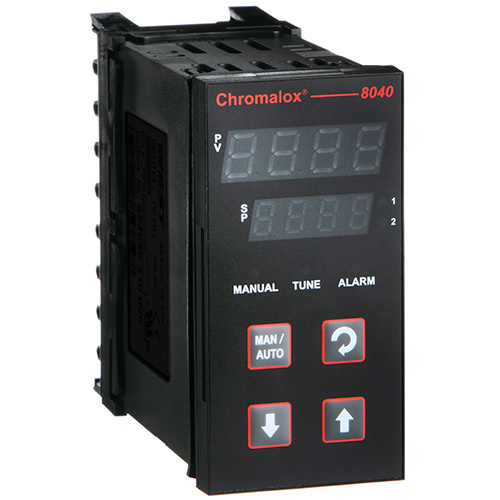 Chromalox temperature controller is pcn 314544 8040-r00000, 1/8 din, soft start,universal input, output 1 relay(2amp resistive at 240VAC), 100-240 VAC Power Supply.